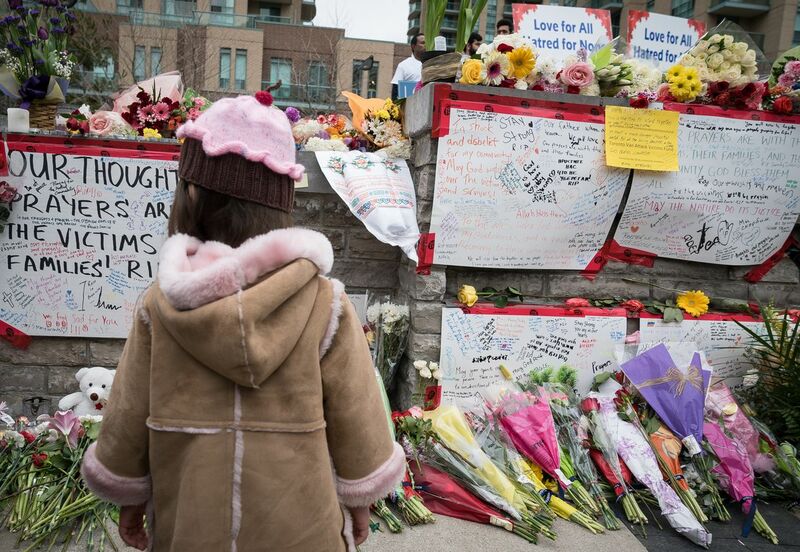 Three-year-old Camelia stands in front of the growing memorial on Yonge Street near Finch Avenue in Toronto for the victims of a van attack that killed 10 pedestrians. 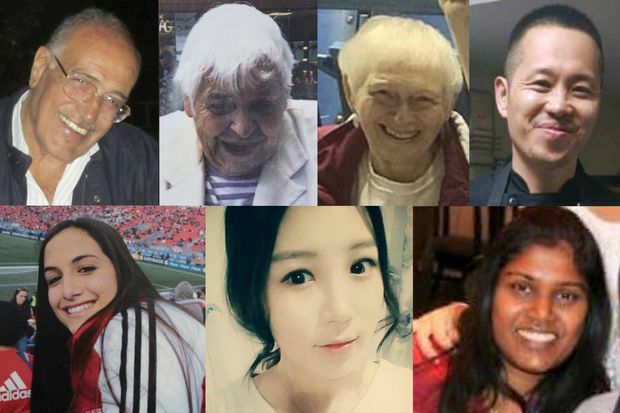 Torontonians are learning more about the diverse range of people killed in Monday’s van attack at Yonge Street and Finch Avenue, and offering help and comfort to the loved ones they left behind. The 10 dead include a Jordanian national visiting family, a Sri Lankan immigrant single mother, a South Korea-born chef working at a Brazilian steakhouse chain, a cancer survivor, an 80-year-old grandmother, a 23-year-old student and an investment-firm employee devoted to charity work. Here’s what we know about them and the 14 people injured. The City of Toronto has partnered with the Toronto Foundation on a crowdfunding campaign for the victims, #TorontoStrong. The city is also working with the Canada Zakat organization, which set up a fundraiser on GoFundMe. Friends of Renuka Amarasingha, one of the 10 people killed, have organized a separate GoFundMe campaign to help her seven-year-old son. Investigators are now turning their attention to motive and filling in the gaps of the suspect’s movements in the hours leading up to the attack, which left a 2.2-kilometre trail of destruction down one of Toronto’s busiest streets. Toronto police are appealing for people who witnessed the attack to call its investigative hotline (416-808-8750). Suspect Alek Minassian, 25, of Richmond Hill, Ont., is charged with 10 counts of first-degree murder and 16 counts of attempted murder. Toronto Police said they are expecting to lay a 14th charge of attempted murder. A Facebook post moments before the attack – which, according to a Facebook spokesperson, apparently came from Mr. Minassian's actual account – made reference to an "incel rebellion." The term "incel," or "involuntary celibacy," has been used by so-called men's rights activists and is often linked to mass shooter Elliot Rodger, whom the Facebook post mentioned by name. The attack: Around 1:30 p.m. Monday, a white van, which had a Ryder Truck Rental and Leasing logo on its side, mounted the sidewalk at the busy intersection of Yonge Street and Finch Avenue and struck a number of people. From there, the van proceeded southbound on Yonge for several blocks toward Sheppard Avenue. Over less than 25 minutes, the van mowed people down in what Toronto’s police chief described as a “deliberate” killing rampage. The van made it roughly 2.2 km before being stopped on the sidewalk near Poyntz Avenue, with severe front-end damage. The van was travelling south on Yonge St. from Hendon Ave., just north of Finch Ave.
A pedestrian was struck while crossing the street at Kempford Blvd. More strikes at Empress Ave.
Watch: Here is perspective from Google Street View of the route taken by the van in the attack in Toronto. In the emergency room: At Sunnybrook Health Sciences Centre, Canada’s largest trauma facility, hospital staff mobilized for a scenario they had long prepared for. The hospital was at 111 per cent capacity when staff were warned of a Code Orange, which means incoming mass casualties. Here’s health reporter Kelly Grant’s report on how the hospital found the space and manpower to care for the wounded quickly. Paramedic ambulances are parked outside the Sunnybrook Health Sciences Centre on April 24, 2018. Ambulances identical to these would have transported victims of the van incident to the hospital. Seven of those killed in the Toronto van attack. Clockwise, from top left: Munir Najjar, Betty Forsyth, Dorothy Sewell, Chul Min (Eddie) Kang, Renuka Amarasingha, Sohe Chung, Anne Marie D’Amico. Alek Minassian, as shown on his LinkedIn profile. Alek Minassian, 25, of Richmond Hill, Ont., was arrested in connection with Monday’s attack. At a brief court appearance Tuesday, he was charged with 10 counts of first-degree murder and 13 counts of attempted murder, and ordered to appear in court by video remand on May 10. Police later said they were seeking a 14th attempted-murder charge. Friends and classmates described Mr. Minassian as a technical wizard who barely spoke and may have had a social disability. Acquaintances who knew him in high school and at Seneca College, where he recently graduated from a computer studies program, said they did not believe he was inclined to violence. But a picture soon emerged of Mr. Minassian’s apparent misogynists beliefs (more on that below) from his social-media posts. The armed forces also confirmed that Mr. Minassian had been in military basic training for 16 days in 2017, but was “voluntarily released” before recruit training finished. The suspect’s public embrace of a misogynist ideology has renewed attention on the “incel” movement, a cause connected with another mass killing in 2014. Incel, or involuntary celibacy, is a label used by online trolls and misogynist fringe groups who blame women – or specifically, their perceived lack of sexual availability – for their problems. The term was originally coined by a woman from Toronto in the late 1990s to describe being a virgin in her 20s, but over the years, it was co-opted by so-called men’s rights movements and users of the forum website 4chan. In 2014, the label was embraced by Elliot Rodger, a California man who killed six people and then himself in a mass shooting in Isla Vista, Calif. The “incel” label and Mr. Rodger were invoked in a Facebook post from Mr. Minassian’s account, dated moments before the Toronto van attack. It referred to an “Incel Rebellion” and praised Mr. Rodger as the “Supreme Gentleman.” A spokesperson for the social-media company told The Globe that the post appeared to come from Mr. Minassian’s real account, which Facebook quickly disabled. The post belonged to the suspect, Toronto Police Homicide Detective Sergeant Graham Gibson told The Globe, though he added that police were not investigating a particular group in connection with the attack. At the crime scene: Across the street from the crime scene, a makeshift memorial was created out of hand-written notes and signs of condolences written out on bristol board. “I walked out, I saw the bodies on the ground, and I saw the streets I walked pretty much every day so I knew something had to be done,” said Konstantin Goulich, who lives nearby and helped to create the memorial. “We have to have an opportunity to heal, but that will take time. Now we just need to express how saddened we are by what happened here today.” Ontario Premier Kathleen Wynne and Mr. Tory visited the memorial that has been created. They added flowers and their own notes of condolences. Torontonians have been visiting the memorial throughout the day to offer their support. They brought flowers and candles, and wrote messages of sorrow, support and resilience in numerous languages. Barriers: Barriers were erected at Union Station, Toronto’s main train station, in the aftermath of the attack. Officials say that increasing security was in the long-term plan but Monday’s attack expedited their actions. The measures were met with immediate debate and pushback. At City Hall: Flags at City Hall and civic centres were put at half-mast, and the “Toronto” sign at City Hall was dimmed. In sports: The Toronto Maple Leafs, who hosted the Boston Bruins at the Air Canada Centre on Monday night, held a short tribute before their game. The Blue Jays, Raptors and Toronto FC also tweeted their condolences. Although we are far from home, our hearts and minds are back in Toronto with those affected by today’s tragic events. All of Canada mourns for those affected by today’s violence in Toronto. Terrible news of the incident in Toronto this afternoon. Deepest sympathies and condolences of our entire Conservative Caucus and all Parliamentarians are with the community as this situation continues to develop. Our thanks to the first responders who acted so quickly.
.@POTUS & I are closely monitoring the attack on innocent people in Toronto this afternoon. We are with the Canadian people tonight as they grieve the loss of life & injured. The American people stand shoulder-to-shoulder with our neighbors in Canada. David Futrelle: Can the radicalization of incels be stopped? Editor’s note: An earlier version of this story incorrectly said that So He Chung was 23. In fact, she is 22. She was also incorrectly referred to as Sohe Chung. This version has been updated.